The enhanced x-ray systems’ design has been engineered to AMI industry standards for machine construction, ensuring fast and convenient product inspection, along with optimum quality assurance. The series is easy to operate and the entire machine can be disassembled by a single person in a matter of minutes for thorough sanitation and convenient maintenance cycles. State-of-the-art contamination detection and inspection capabilities are used to ensure reliable inspection of unpackaged bulk products, such as raw beef, pork, chicken and lamb. The RMI3/B has a wide conveyor belt of up to 539 mm (21.2”) in width, a conveyor speed range of up to 37 meters per minute (120 FPM), and a maximum throughput of 50 tons (45 metric tons) per hour. Its unique troughed belt design improves product presentation, reduces sanitation requirements and optimizes x-ray cross section for superb product inspection performance. 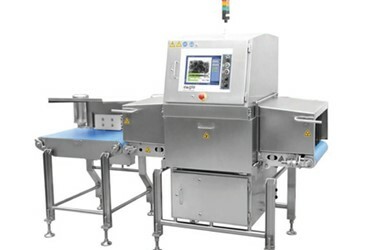 The Eagle RMI3/C x-ray system is identical to the RMI3/B, however, it is designed specifically for product inspection of closed cartons or open crates of raw beef, pork, chicken, lamb or similar products. The Eagle PRODUCT SWITCH™ is optimal for applications that process varied styles of cartons or crates. It delivers an automatic product changeover without stopping the production line, minimizing downtime and strengthening quality assurance.